Extra heavy pizza sauce with sea salt and fresh whole leaf basil in a non-standardized product. 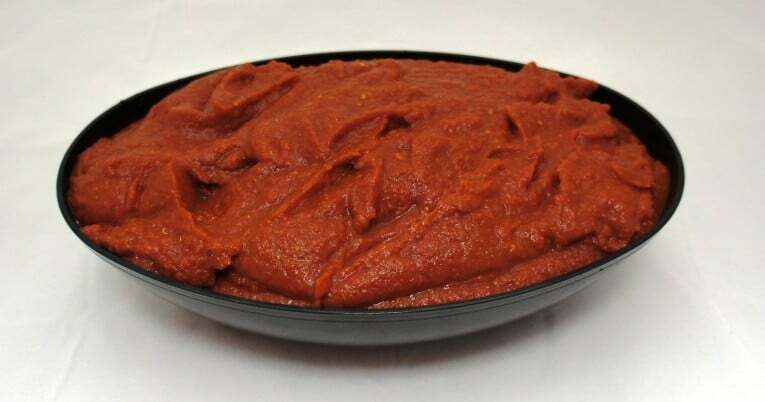 It is prepared from tomatoes that have been washed and inspected prior to being chopped, stained, and evaporated. This product only contains sea salt and whole leaf basil as added ingredients. It does not contain oil or other seasonings as prepared pizza sauce styles do. The product is hot filled to ensure commercial sterility then cooled for stacking. Extra heavy pizza sauce with fresh basil has a coarse finish and may contain seed particles or occasionally a whole seed. It has a bright red color.